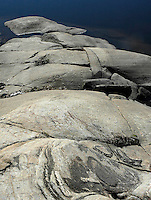 The French River has a colourful past. For thousands of years before Europeans arrived, Aboriginal people used the river as a place to meet and exchange trade goods. Early French explorers and missionaries began travelling through the area in the early 1600s, leaving behind intriguing journal records about the river and the people who lived along its shores. Before Canada became a country, Voyageurs were paddling its waters - brigades of canoes portaged around rapids and waterfalls - transporting furs from Canada's great Northwest to market in Montreal. Because of its historic significance, "the French" was designated a Canadian Heritage River in 1986. Flowing 110 kilometres from Lake Nipissing to Georgian Bay, this waterway park has more than 230 interior campsites and offers a variety of water-based recreational activities in an outstanding natural setting.